Gabe Grunewald is one of the most inspiring and upsetting stories in sports right now—at just 31 years old, her running career has been interrupted by cancer three times, in 2009, 2011, and 2016. In 2017 she somehow raced a partial schedule through the U.S. championships while undergoing chemotherapy. It was simultaneously incredibly impressive that she was able to race at all and painful to watch her gut way through races. Her story rightfully captured tons of national attention; as she continued receiving treatment this year, she has used that attention to raise money for cancer research. From there, Gaines decided to create his own marathon, with proceeds benefitting Grunewald’s brand-new foundation. The race was this past weekend in Waco, and Grunewald and Gaines say it raised $250,000 for her foundation. It also offered $88,000 in prize money—a very healthy purse for any race, much less one happening for the first time. Women’s half-marathon winner Betsy Saina—who gave LetsRun an amusing account of paying her own entry fee and jogging her way to a $10,000 payday—told the website “I saw the money and I knew for sure there would be drug testing. That was what I was assuming anyway, because who would pay you $15,000 or $10,000 without drug testing?” Men’s runner-up Ryan Dohner, who picked up $7,500 but finished behind Reta, tweeted that he wished there were testing. It seems that this was mostly an innocent mistake caused by Gaines being new to running—Monti told LetsRun that an adequate doping control could cost as little as $2,000, which wouldn’t have exactly threatened the race. 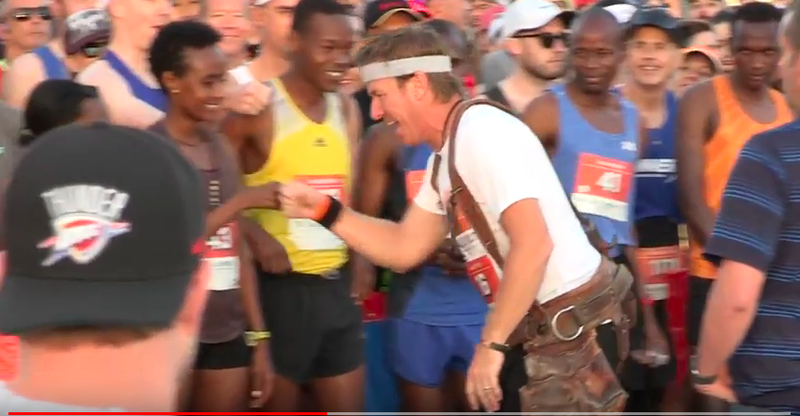 While a reality TV star creating a marathon for cancer research and having to pay out tens of thousands of dollars to dopers who did their homework is objectively funny, one person wasn’t amused by the coverage: Grunewald. ...And to those of you really ticked off about the situation here this year I’m here to remind you that there ARE actually bigger problems in the world than doping in sport. This event got 6,000+ people moving in Waco, Texas for a worthy cause (cancer research) and most people had a wonderful experience in the process. That’s pretty damn admirable in my book. The other stuff can wait until next year. And when you get bucked off your high horse, I think you’ll agree. You can read her whole post below.